How many times have you looked at a pristine white or ivory piece in a shop window, and paused? White and ivory pieces have a charm of their own, and they can add that understated luster to any wardrobe. And the best bit is – you can never go wrong with white! Or ivory! White and ivory pieces are considered as royal colours that set you apart in a crowd. Goodness and purity are just a few things that are symbolised by white clothing. In fact, in ancient times, white was the colour worn by the aristocracy and members of the royal family. White and ivory pieces are definitely having a big fashion moment, if recent celebrity weddings in India and abroad are anything to go by. Meghan Markle and Sonam Kapoor both dazzled the world in their white and invory pieces, with the latter even opting to host an entire event with an ivory dress code. Out came the Abu Janis and Sandeep Khoslas, with a royal yet subtle look! And of course, the sheer versatility of white is what makes it a winner all the way – gemstone jewellery, gold pieces and even chunky silver can all be paired successfully with your white and ivory pieces. The Oriental Express takes a ride back in time to find its Victorian partner in crime! Baise Gaba, as featured on The White Muslin, is the designer behind this flirty and pretty mulmul creation. Take this princess cut dress to work with the culottes that add an understated layer to the ensemble – and watch the compliments flow! The pretty Oriental print presents a feminine look while the ruffled collars and cuffs make for a Victorian vibe that is delicate and oh so child – woman, at its very core! I would love to pair this ensemble with this rustic wonder necklace crafted out of polymer clay by designer Dolly Mahapatra for Fuchsiaa. 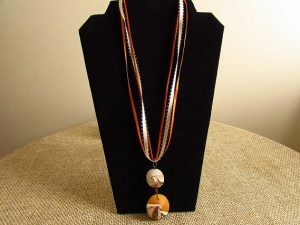 The orange and mustard strands as well as the oval pendant with the swirls makes for a bright look and the perfect combination with the red prints. The satin strands add to the Victorian theme of this look. And as for the hair, here is a really cool look by ace stylist Abhishek from the well known hair and makeup studio Zulf. 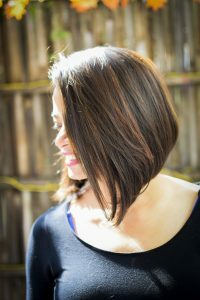 I am in love with the razor sharp, asymmetrical bob edge that literally challenges the uber feminine look of the outfit. Yet, it matches step with the somewhat symmetrical modernity of the necklace as well. And to finish, add a dupatta if you want to take the look from morning to evening with just a little bit of glamour. Add the right hint of razzle and dazzle with this dupatta from Aekta Dhingra Couture. 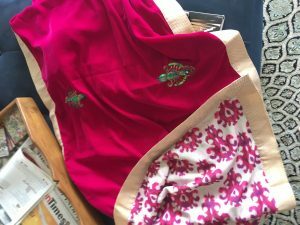 This pink velvet dupatta with an ikkat print on the reverse can be paired with the outfit as a shawl draped around the shoulders, or hung from the bag while stepping out for an important work do. The bright pink hues act as the perfect contrast when it comes to the print on the ensemble and the pretty orange hues of the necklace as well!